How Is Skill In Coping With Change Like A Bowl Of Soup? There is a significant challenge in turning “I know this from the book” into “this is how we operate as an organisation”. Insight creates understanding; understanding enables action, purposeful action delivers results. We deliver insight B2B. 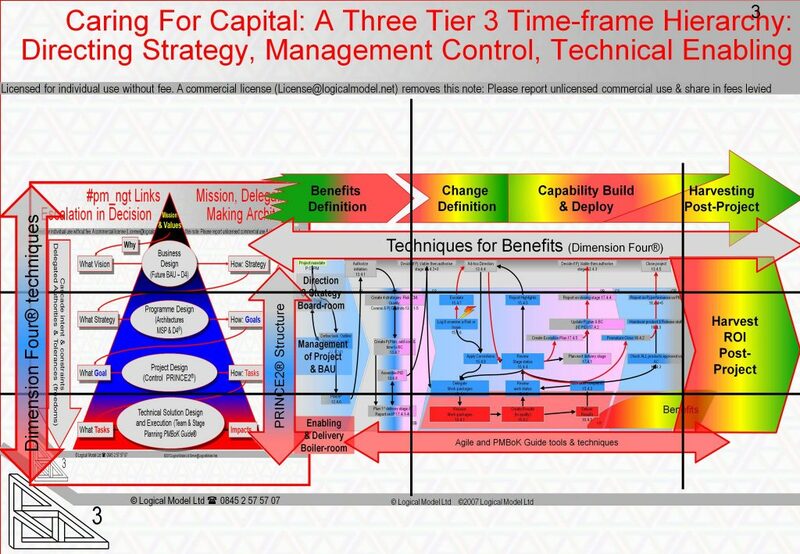 The right way to deliver shareholder value and public services (caring for capital in all its forms) is with skill-full common-sense, with ‘agile’, with portfolios and programs, with kanban, PRINCE2® and Dimension Four®, with Six Sigma, PMBoK-Guide® and Lean ideas (et.al.). We deliver holistic B2B training that builds on your existing investment in project management methods and standards to deliver capability beyond that of standard industry credential training. These are the ingredients whose mixing is a Bowl of Soup. If you make tomato or vegetable soup then before the ingredients such as the carrots and tomatoes go into the pot they are clearly and discretely visible. 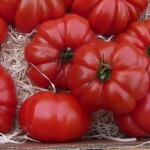 Once the soup is made its red colour is clear indication that there are tomatoes in the melange. With the aid of a spoon it is easy to find a discreet piece of carrot and the peas but not any longer possible to isolate the salt, remove the water or see the ingredients as the separate items that the recipe called for to be prepared and combined. From a bowl of soup it is hard to reverse engineer what the ingredients where that with process ended in a warming, tasty treat. 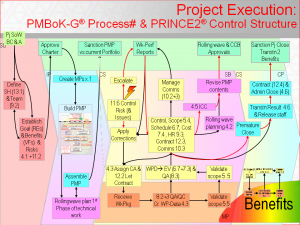 PRINCE2® is a recipe book, PMBoK® a book of ingredients, ‘agile’ melds many philosophies. Together they all describe discreet ingredients that are combined within the work context and they describe some of the techniques by which to cook-up a project. Your challenge when translating the myriad of competing, branded collections of components is to see how they each contribute practical industrial-strength competencies BUT none is wholly right or even individually sufficient. To become capability they need integrating across your organisation’s culture and across the hierarchy of your organisation. Good ‘care of shareholder value’ requires the move from ‘collection of ingredients and methods’ to ‘soup’. It is the assimilation of explicit facts into implicitly understood behaviours that marks transition from knowledge to skill. It is the building of Shared Mental Models that marks organisational capability. Anyone can develop capability from knowledge with study, focus, practice. The journey is quicker and richer with a guide. A group – like the typical organisation’s management hierarchy – probably CAN’T develop the skill without a vision, sponsorship and a guide. We can provide the third of the components of success and have the tools by which you can formulate the first. While not exhaustive some points are illustrated in the near 300 SOoPs Simon’s Observations On Projects listed at the destination of this link. PRINCE2® is a powerful, lightweight and elegant model for project CONTROL across the direct/manage and manage/deliver interfaces. It is NOT suitable for beginners. It says WHAT not HOW to plan or track a project. It needs tools & techniques added for the what; either or both of PMBoK-G & Agile. Exam focussed training for individuals is useful for their career development. Less so for improving an organisation’s maturity. 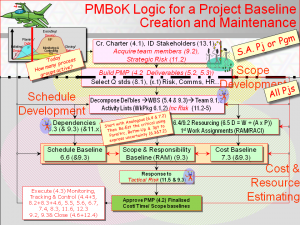 PMBoK® is a (confusingly) structured collection of great planning and tracking insights of ‘inputs → tools and techniques → outputs’ It does NOT say how to wrap project controls around a project and while NOT specific to any development approach has been pigeon-holed by many as ‘waterfall’ based – It’s contents is valuable in all contexts. The current (6th Ed) was billed during development as being more ‘Consult’ than ‘Command’ but didn’t deliver – But agile methods do give us th emissing peice of the jigsaw puzzle. Agile, PMBoK and PRINC2 are each 25% of the whole story. The other 25% is cascading vision and harvesting benefits. ‘Agile’ is a composite term for first) a mind-set then) some tools and techniques mixed with bias and ‘religion’. Its messages’ borrow from PMBoK-G, prince, Lean, 6Σ and many other places. Its full of good insight, some confusions and it is surrounded by hype. An agile mind-set applies everywhere, its rigid discipline doesn’t. Inappropriate use is as damaging as ignoring it completely is debilitating. The whole assemblage is a new generation of thinking that creates assured delivery of outcomes in operations from activity in projects (& programs) right across the full CTO/RTO portfolio view. The PRINCE2 manual sets out the activities such as 14.4.1 Appointing the Executive & the Project Manager and 14.4.3 Designing and appoint the project management team as discreet ingredients. As the project is executed a single conversation such as “Hey Simon can you drop by my office this afternoon and bring Jane and Fred – we have a new product launch” has just performed two of the initial three SU activities without necessarily finishing them in their entirety. This conversation may be (without need of further paper-work) at a level of formality sufficient for the organisation to be in control. Appointing team members often drags-on past Starting Up a Project (SU) and into the Initiation Stage. Using PRINCE2 is about following principle, not blindly applying process. It is as good as anyone needs and in real environments you never have to use its name or its labels to be following its valuable guidance. Managing Successful Programmes slightly broadens P2’s insights in useful ways. There are no ‘better’ control framework solutions. Equally there really isn’t a wide choice of options to shop around and choose between either; – a bit like buying petrol – it’s just ‘petrol’. Neither PMBoK nor PRINCE2 tell us how to build products or how to define Vision. Both start with a presumption that the organisation has visioning skills. Both treat product development as outside their scope – mostly rightly but they are shy of the ‘joined-up’ interface that agile provides – BUT Oh Dear while agile is great at product development it outsources all the business linkage to a ‘Product Owner’ and quietly omits to say that some of its strengths have limited applicability. PRINCE builds the governance framework that Public Servants and Company Executives need while wise selection of Agile and Traditional Development Life-Cycles lead to the best through-operational-life balances between acquisition and ownership concerns. PRINCE2 is a framework that adds to pre-existing competency in the basics of project planning and tracking as described in PMBoK and in Agile methods. In order to benefit from PRINCE project management staff need to know how to create plans (P2 doesn’t tell you how!) Project sponsors need to recognise and embrace that PRINCE2′s purpose is to expose and support their accountability for successful delivery starting from defining a compelling vision of benefits for all who will contribute to success. Sponsors must however be competent to define, explore and communicate the vision of what is to be delivered and the constraints that reality places on delivering those accountabilities. The philosophies, steps and tools of D4 are a huge help. Those who think education is expensive have not accounted for what they pay daily due to ignorance. Attendees after a training course need 1) opportunity to practice skills ‘back@work’, 2) a manager who understands that new ways take practice to be performed well, and 3) sources of support to ask questions of and seek advice from. LML’s b2b training approach mentors the manager and the trainee. (the middle tier may split for program and project levels, the middle is both Caring for Change and Caring for Business as Usual operations). There are three structured tool-sets that match to the 9 interactions of Lead/Manage/Deliver over Define/Build/Use. D4 extends from above change down to its control, P2 covers just the control interfaces to up to the project board and down to the technical staff and PMBoK and Agile are mostly the tools of schedule and budget creation and reporting across internal staff and subcontractors that enables Work Performance Data flows from ‘Red’ to ‘Purple & Blue’ in the diagram. Each of D4, P2, PMBoK and agile are necessary and none is individually sufficient, they overlap, leave gaps and none is widely discussed from a detailed knowledge of the others – they should be; we do integrate then all and your ROI, VFM or ebitda will improve when you do too.